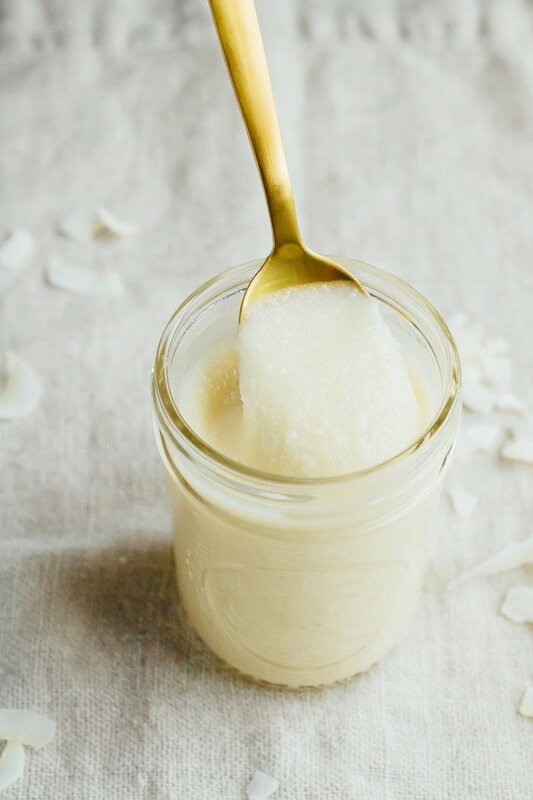 Learn how to make coconut butter at home in your blender or food processor! 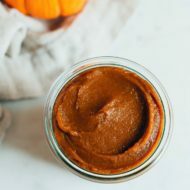 Once you figure out how easy, inexpensive and delicious it is you’re going to want to spread coconut butter on everything. 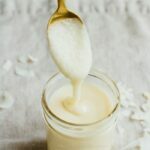 I was first introduced to coconut butter a few years ago when I stumbled upon a raw dessert recipe that called for it. I searched my local grocery stores for coconut butter without much success and ultimately just ended up figuring out how to make my own. Now you can find coconut butter at almost any natural grocery store (or order it online). That said, one jar can set you back around $15 so making your own is an easy and inexpensive alternative. Before we get started with how to make coconut butter I just want to point out that there is a BIG difference between coconut butter and coconut oil and they’re used for different things. Coconut butter is made by grinding dried coconut meat into a paste. So a jar of coconut butter is the pureed meat but it has some coconut oil in there too — just like almond butter has a little almond oil in it. Coconut oil on the other hand is JUST the oil that’s been extracted from the coconut meat. When you think of it like almond butter and almond oil or tahini and sesame seed oil it makes a ton of sense! 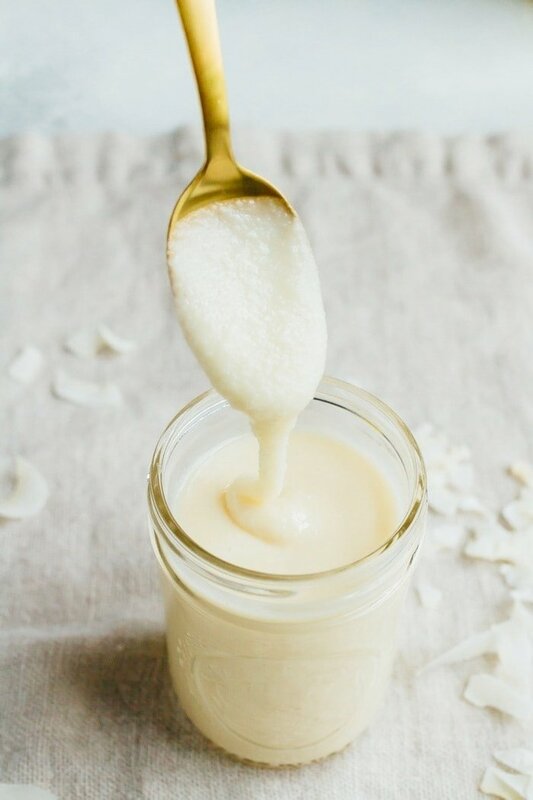 Like coconut oil, coconut butter is solid at room temperature so in order to use it as a spread or drizzle you have to warm it up. I like using the water bath method — placing the sealed jar in hot water for 5-10 minutes until it’s melted and you’re able to stir it. If you’re in a rush the microwave also works. 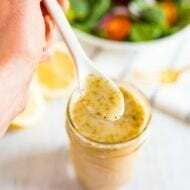 Once melted, you can use coconut butter to replace cream, cream cheese and butter or blend it into smoothies, sauces, dressings, desserts and baked goods. I’ll do a roundup post soon with lots of coconut butter ideas. For now, let’s make some! 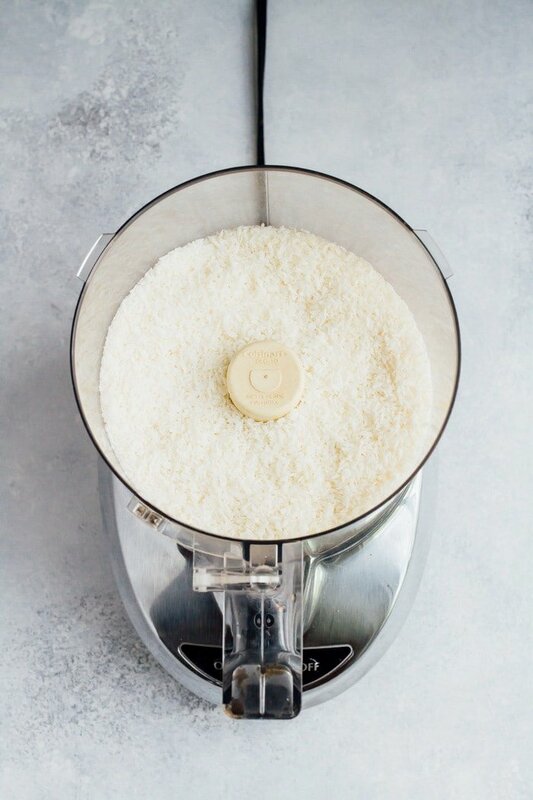 Place coconut shreds or flakes in a food processor or high powdered blender and process until a smooth, runny butter forms. It will take about 15 minutes in a food processor and about 2 minutes in high powered blender. (I’ve found that my Vitamix works best for this.) You may need to scrape the sides of your food processor or blender mid-way through the processing. Store coconut butter in an airtight jar at room temperature. It’s shelf-stable and doesn’t need to be stored in the fridge. Depending on the temperature of your house the coconut butter will likely harden up so you’ll need to warm it up before using. 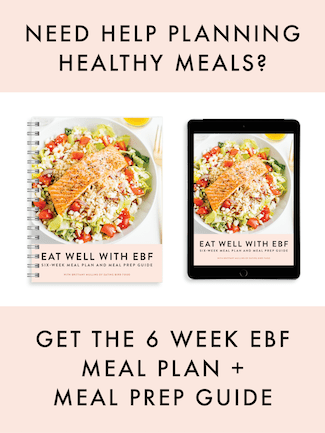 The water bath method works great or you can scrape a chunk off the top and place it on something warm to melt (like pancakes, waffles or toasted bread) or simply pop it in the microwave for a few seconds. I love coconut butter, especially all by itself on some toast! But you’re right, it’s so expensive to by. This is the perfect alternative (and along with some fancy jars, makes a great gift!). I have never thought to make my own coconut butter. Thanks for the great idea! Of course, Emily!! I hope you love it. Is the serving size 140 calories per 1 tablespoon? Coconut butter is usually about 100 cals for 1 Tablespoon so the serving size here is a little less than 1 1/2 Tablespoons. Hope this helps! 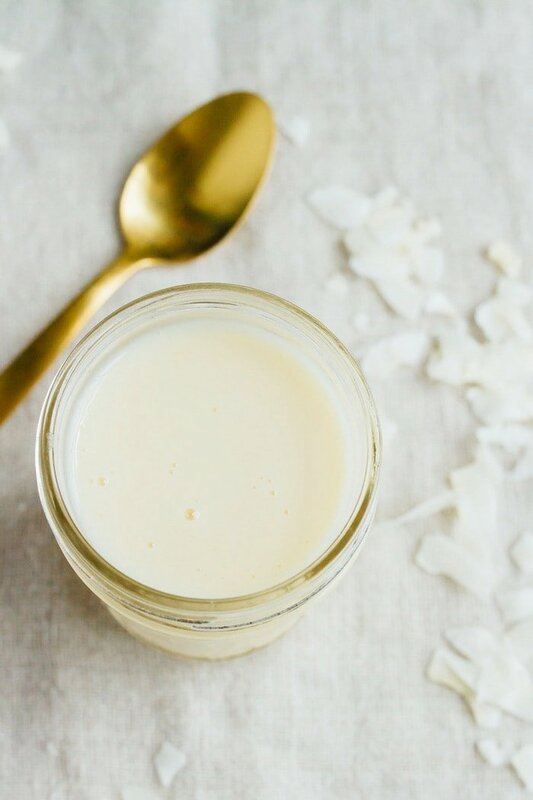 I had no idea you could use coconut butter to replace cream cheese in recipes!! I’m intrigued!!! This looks so good. A little store bought hack if you ever need to buy it is to by creamed coconut which comes in the little cardboard packs, it’s the same thing but WAY cheaper! Thanks for this post. I just saw a recipe today that called for coconut butter. Definitely giving this a try. What high speed blender do you have/use? Awesome. You’ll have to let me know what you think of the coconut butter. I have a Vitamix (the 5200 series) and love it. Noting that you mentioned adding in a little bit of coconut oil. . . .not seeing quantity in recipe. A dite ?! Is there a certain point when you find it best to add it in ? At the beginning ? Just when all becomes work for the blender or cuisinart ? There’s no need to add any coconut oil to the recipe. Just blend the shredded coconut until it’s creamy. Yum! How long does this keep? I made this yesterday. Super easy and I’m sure it’s a fraction of the cost compared to buying premade. I purchased the shredded coconut in bulk and reused an 8-ounce mason jar. Hooray!! I’m so glad to hear that the recipe worked well for you! Enjoy your butter!